Ludger Schuknecht took up his duties as OECD Deputy Secretary-General on the 3rd of September 2018. He employs his extensive experience in international economic policy and decision-making to promote the OECD efforts on sustainable development, growth, and “better policies for better lives”. 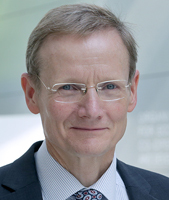 Ludger previously worked at the German Federal Ministry of Finance, where he held the position of Chief Economist. He advised the Minister on fiscal and economic policy issues and the international economy. He was also responsible for coordinating the finance track of the G20 process and worked closely alongside the OECD on programs such as the Compact With Africa, the promotion of OECD codes, and digital taxation. Ludger has had a long career in international organisations. Assignments included Senior Advisor at the European Central Bank, where he worked on fiscal policies, monetary policy decision-making and European policy coordination, the World Trade Organisation and the International Monetary Fund. Ludger studied Economics at LMU Munich University (Germany, George Mason University (United States), where he received an MA, and at the University of Konstanz (Germany) where he got his PhD. His research focuses on fiscal policies and its linkages to the financial sector and the international economy.